Supplementary content is bonus content that comes with certain titles, often in the form of a PDF ebook (with illustrations, maps, diagrams, etc.). A title with supplementary content will say "includes supplementary content" on its details page. Go to your Loans page (under ). Select next to the borrowed title, then select Download. The supplementary content will download separately from the title. Note: Most PDF supplementary content needs to be opened and read on a computer with Adobe Digital Editions. Titles with supplemental materials have bonus content, often in the form of a PDF ebook (with illustrations, maps, diagrams, etc.). A title with supplemental materials will be marked as "enhanced." 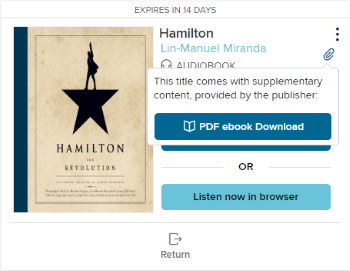 When you borrow a title that comes with supplemental materials, you'll find them both on your Checkouts page (under your Account). From there, you can download them separately.